Strainly‘s goal is to foster the preservation of cannabis genetics and phenotypes in a convenient way. We want to make cannabis preservation ubiquitous, which means, you should be able to use Strainly whether from home or on the go! Today we’re going to give you a few tricks to improve your mobile experience. Strainly is a web-based app. While many product companies rush to release their app, we took another approach: putting our efforts on offering a great site, with great user experience, learning from users’ feedback, and when mature enough, release our mobile apps on iPhone and Android. Releasing a buggy app for the sake of having an app… is just not an option here! However, Strainly’s web app is already super mobile-friendly and responsive to any screen size and format. It already behaves pretty much like an app. Make sure you allow your web browser to remember your log in info, so that you don’t have to log in every time you go on Strainly. Handle your phone or tablet horizontally, to enjoy a wider browsing surface and improve comfort for your eyes. Depending on the size of your screen, it will probably improve navigation. This is especially true if you want to post new strains. Last but not least, SAVE the shortcut to your home screen! This will show a Strainly icon on your phone or tablet home screen, alongside your other apps. You no longer have to open your web browser and type Strainly in the URL/search bar. You just have to unlock your phone, tap the Strainly icon and… you’re on Strainly! See below how to do that! 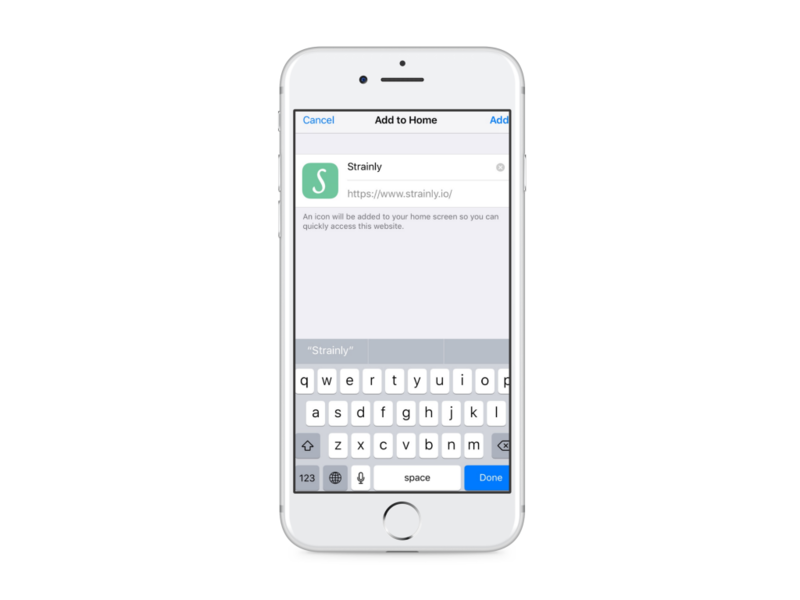 And here you go… you can now access Strainly in one tap!